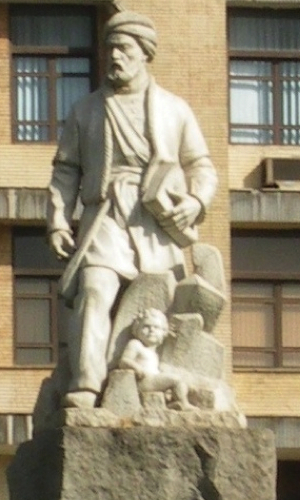 Statue of the poet Ferdowsi, Tehran. The child depicted at his feet is Zal, a character from the Shahnameh. Early in 2008, I began work on a new novel, entitled Zendegi. The plot involved brain mapping, virtual reality, and the coming of democracy to Iran. I’d already learnt a bit about the country through conversations with some of the Iranian refugees whom my own loathsome government had seen fit to inter in remote detention centres for many years, and when it came to the novel I was hoping that with enough reading and research I’d be able to make the details ring true. Over the next few months, though, it occurred to me that there was nothing stopping me from travelling to Iran myself. One of the books I was relying on for maps was the Lonely Planet guide, and every time I turned to it to find the location of a hospital or government building, it also offered me a hotel just around the corner from the places I was writing about. Why make do with maps and other people’s accounts, when I could experience the sights and sounds of these locations first-hand? As it happened, I hadn’t travelled outside Australia before — as much out of a lack of a compelling destination as anything else — so why not make this my first trip? Compared to some people’s choices of wilderness treks through Peru or Nepal, urban Iran would present no physical hardships, and I’d learnt enough Farsi from my refugee friends not to feel completely daunted by the language barrier. As I write these words, in 2009, Iran is still in turmoil after the June presidential elections, but in June 2008 everything was calm. When I applied for a visa, I wondered if the Iranian authorities might have kept records of the half-dozen (very polite) letters I’d sent to various government officials over the years at the behest of Amnesty International, requesting the release of political prisoners, but if they were still on file somewhere they weren’t enough to disqualify me as a tourist. In August, I discovered that a synopsis of Zendegi that I’d written for my UK publisher — which included the fact that the journalist hero witnesses the downfall of the Iranian regime — had somehow leaked out of their computer, despite my having plastered warnings all over it begging that it not be made public before 2009. Miraculously, only Amazon in Germany put it online initially, but then several other sites picked up their announcement. My publisher released a new, less revealing synopsis to Amazon to overwrite the old one, but I had to beg the other sites individually to amend their records. Thanks to Google’s leisurely update cycle, for a couple of months prior to my trip anyone who felt an urge to search for ["Greg Egan" Iran] would see, as their first hit, an incriminating fragment of a page still available from Google’s cache, describing my forthcoming novel in which the Ayatollahs got the boot. The chances of any of this causing me problems might not have been great, but an Australian author had recently been imprisoned in Thailand for insulting a member of the royal family ... and his book had only sold 7 copies. The Thai authorities had read the offending passage quoted online, on someone’s blog. Unlike my novel’s protagonist — who flies to Tehran via Singapore and Dubai — I’d booked a somewhat cheaper route: first to Kuala Lumpur, then direct to Tehran with Iran Air. I was expecting the journey to begin on the evening of Sunday October 12th, but after waiting from midnight to dawn while engineers checked out a mechanical problem with the aircraft, we were told that the flight to Malaysia would now have to leave the following afternoon, as replacement parts needed to be brought in from overseas. I went home and started re-organising my itinerary; the next connecting flight to Iran would be two days after the one I’d missed, and the only way I could make things work without trying to alter four different hotel bookings at short notice was by dropping one city, Kashan, completely. When I returned to the airport on Monday afternoon the plane was still grounded. I managed to get booked onto a flight for the following day, but I was beginning to wonder if the whole trip was going to unravel. From the start, I’d planned to travel in mid-October, shortly after Ramadan, but I’d applied for my visa much earlier, afraid that the process might take months. In fact the visa had been granted far sooner than I’d expected, but as a consequence it would also run out sooner: in less than a week it would no longer be valid for entry. If I got into the country before then, I would be allowed to stay for 15 days, but my margin for any further mishaps was being whittled away. The next day, the flight from Perth to Malaysia left on time. In Kuala Lumpur, I was whisked along a palm-lined highway in a minibus to a hotel the airline had organised, then whisked back in the morning after a few hours’ sleep. Joining the throng of Iranians queuing at the check-in counter, I finally felt that I was on my way. Malaysia is a popular destination for Iranians, and everyone had luggage carts piled high with shopping. The flight to Tehran took eight hours. I was so tired that I didn’t feel confident trying to converse in Farsi with the passengers beside me; instead, we just exchanged brief greetings in English. Iranian movies played on the in-flight system, punctuated by a route map that showed us cutting across southern India. It was surreal to contemplate all the millions of people passing by unseen below, the geographical realities short-circuited almost as thoroughly as if I’d stepped into a teleportation device. No negotiating ocean currents, let alone the dozen or so languages and cultures that such a journey would once have entailed. As we approached Tehran, people with window seats started calling to their friends and pulling out their phones to take snapshots. The peak of Mount Damavand — the country’s highest mountain, and the site of numerous mythical apotheoses — was poking photogenically through a blanket of clouds. Alas, my only camera was packed away in my suitcase in the baggage compartment. There were long queues in the airport, but my passport and baggage checks went smoothly: no immigration officials had Googled me and discovered my seditious fantasies. I changed two hundred US dollars into close to two million Iranian rials; even in 20,000-rial notes that was a lot to stuff into one pocket. A friend had loaned me a money belt, but that could wait until I reached the hotel. The lady at the taxi booking desk smiled approvingly when I greeted her and stated my requirements in Farsi, but then like an enthusiastic language teacher she kept pushing me to find my limits. She insisted that I spell out my name, which was fine (alef gaf alef nun), but then she wrote ghaf instead of gaf and I gave in and fumbled for my visa rather than struggling to correct her verbally. I suspect she was joking with me, because the guttural sound of the letter ghaf would never be needed in the transliteration of the Western name she’d already heard me pronounce. The seatbelts in the back of the taxi were broken, and though the driver was bemused that this bothered me he invited me with gestures to sit beside him in the front. Apart from giving him the hotel’s address I kept my mouth shut. The highway from Imam Khomeini Airport ran through barren land at first; if not for the billboards with posters of Khomeini and Khamenei — Supreme Leaders past and present — I might almost have been in the Australian countryside. We passed some fields in the distance, then industrial precincts of low concrete buildings, then we hit the city itself just in time for the evening rush hour. 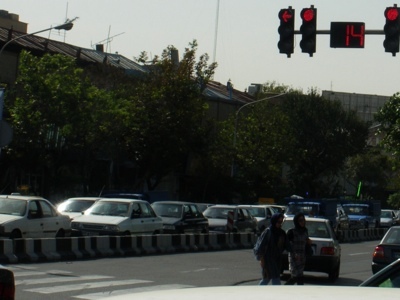 Traffic in Tehran is dense and chaotic at the best of times; though drivers mostly obey the traffic lights, uncontrolled intersections are wild free-for-alls of honking and playing chicken. In the Hotel Atlas on Taleghani Avenue, I summoned up my courage and tried Farsi again: Salaam agha. Yek otagh rezerv kardam. Everything went smoothly; the reservation I’d made by fax, and amended when my flight was delayed, had been duly recorded. My room was in the back of the hotel, across a small courtyard. I hadn’t had a proper night’s sleep since Saturday; I didn’t bother looking for a meal, I just showered and went straight to bed. I woke early, and after spending some time checking maps and preparing for a few tasks that lay ahead, I wandered out to explore Tehran. My hotel was in the same street as the former US Embassy, site of the infamous hostage crisis that began in November 1979. This compound is now occupied by a militia group, and while there are no signs forbidding photography of the external walls — which are decorated with political murals like the one shown on the right — my guide book warned that some people had had their cameras confiscated here. I decided to be prudent, and took this picture from across the street. In an internet café I emailed friends and family to let them know I’d finally arrived. Oddly, The Australian’s web site was blocked, but the ABC’s wasn’t, despite carrying a report on international condemnation of Iranian nuclear policy. One of my tasks for the day was to book a domestic flight from Shiraz (which I’d be reaching by bus) back to Tehran at the end of my journey. I’d memorised what I’d need to say, and even written down all the details as a backup; what could possibly go wrong? But when I explained my request to the travel agent, she departed completely from the script I was expecting. I was reduced to declaring apologetically: Bebakhshid, namifahmam. Sorry, I don’t understand. She fetched an English-speaking colleague to explain: bookings were not yet open for a flight that was still 12 days away. I’d have to come back on Saturday. Having a smattering of Farsi was certainly better than knowing none at all, but it didn’t take much to reach my limits. It’s easy enough to plan your own half of the dialogue for what seems like a simple task, and to prepare for what you think are the most likely replies ... but when your vocabulary is limited and the conversation takes an unanticipated turn, no amount of rehearsal can make up for the lack of a broader knowledge of the language. Next, I needed to catch the metro to the southern bus station. My 2004 travel guide put metro tickets at 650 rials, so when I offered a 2,000-rial note at the counter and was waved away angrily with no explanation I could understand, I assumed that the ticket seller wanted something smaller. I hunted around in vain for something I could buy that would leave me with just the right change, then finally gave up and tried at another station, where a woman explained in English that the tickets were IR2,250. A sign with the price on it would have been helpful, and even a curt demand for bishtar (more) would have got the message across, but whatever the first ticket seller had said, it had gone right over my head. The southern bus station was a huge circular building, with counters for the various bus lines arranged around the rim. This was where I was most grateful that, however poor my vocabulary, at least I’d learnt to read Persian-Arabic script. Virtually all street signs in Iran duplicate the names in the Latin alphabet, but here most of the companies advertised their destinations in Persian script only. I found a counter offering Esfahan, and succeeded in booking a ticket for the following Sunday without any problems. Minutes later, though, I managed to make a fool of myself one more time. When I asked for ab-e-porteghal (orange juice) at a food stall, the boy at the counter held up four fingers. Four ... what? Surely an orange juice couldn’t be more than a return metro ticket, so he had to mean four hundred rials. “Chahar sad?” I checked, and he agreed. I handed him 2,000 rials and waited, expecting change. He stared at me as if I was an idiot, and then mimed that I should give him more. In agreeing to chahar sad, he’d meant chahar sad toman; one toman is ten rials. At IR4,000, or about fifty Australian cents, the drink was still incredibly cheap, but this proved that I was going to have trouble guessing even relative prices. As well as simply wandering around trying to get a sense of Iranian street life, I had some specific “location scouting” and fact-checking to do. In Zendegi, an escalating series of protests sweep across the country, and the scenes I’d written in the novel’s first draft had been based partly on accounts of earlier demonstrations. But the physical geography of Tehran was changing, and many of the choices I’d made from street maps alone turned out to be absurd. When I went to Enqelab Square — the location of a number of protests in the past — it was a construction site surrounded by fences, with no clear sign of what would emerge there in the future. Enqelab Avenue, where I’d tentatively set one march through the city, turned out to be an obstacle course of flyways, overpasses, and median-strip bus stops. 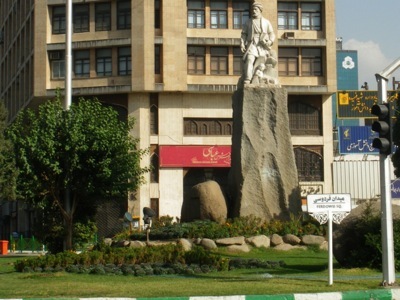 Ferdowsi Square — named in honour of the famous poet, whose epic work the Shahnameh plays a major role in Zendegi — turned out to be a perfect substitute for Enqelab Square. Later, I walked over to the Parliament, or Majlis, where in the book another demonstration takes place, and worked out a possible route for the march that followed. Photographs of the Majlis are forbidden, and I wasn’t crazy enough to try to take a clandestine shot; it was enough just to see the building for myself and discover what the precincts looked like. As I plotted these fictitious protests, I had no way of knowing that just nine months later Tehran would be shaken by demonstrations as large as any I’d imagined in the novel. 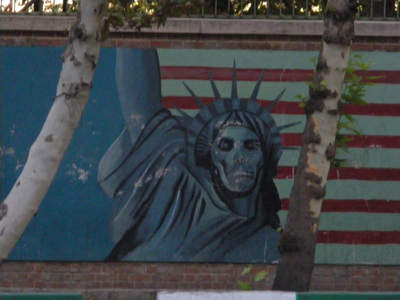 My biggest worry when I started writing Zendegi was that no one would believe the Iranian pro-democracy movement could possibly gain any real traction as early as I’d described it, in 2012. On my last day in Tehran, I succeeded in booking the flight back from Shiraz, after changing some more money. As seasoned travellers no doubt know, the logistics of this can sometimes be tedious; your hotel likes to hang on to your passport so you don’t run off without paying the bill ... but the banks insist on seeing it for ID purposes. A pamphlet from the police in my hotel room advised travellers that a photocopy of their passport would be good enough for most purposes, but the copy I’d brought cut no ice with the bank. I also found it hard to fathom the queueing system in Iranian banks, and correctly judge just how assertive you need to be in order to get served; I probably spent half an hour having tellers stare right through me as if I didn’t exist, because I hadn’t managed to decode the protocols and I was standing in the wrong place, or failing to make the right kind of eye contact. 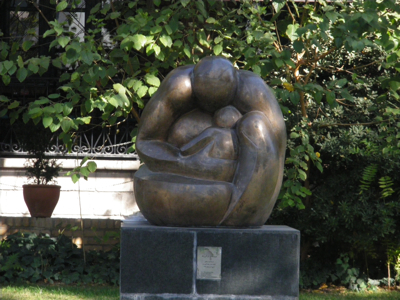 After that, it was a relief to wander around Tehran Garden, a park full of beautiful sculptures just a few hundred metres north-east of my hotel. In the afternoon I went to the city’s main bazaar, a warren of passages crowded with people constantly dodging motorbikes laden with stock. It was curious how the stalls were clustered in highly specialised areas; you could find three or four places that were all selling literally nothing but socks, right next to each other. 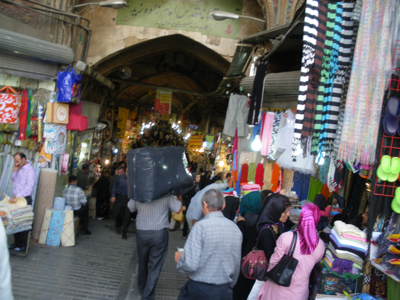 I chatted with a few bazaaris; the conversations never went much beyond where I was from and how long I’d been in Tehran, but people’s friendliness was palpable.